Here on Shoptalk, we have talked a lot about “firsts” – The first supercar, the first muscle car, the first thing to do in an accident, etc. And today we once again look back at one of those firsts that helped shape automotive culture: the first Lamborghini. It’s strange to think of a time when Lamborghini wasn’t so ubiquitous to car culture. A time before music videos and action movies would proudly show off their sleek blockbuster machines. The fact of the matter is, every story has a beginning. For Lamborghini, their beginning starts with the 1964 350 GT – car that signaled Lamborghini was a force to be reckoned with. Lamborghini began as an Italian brand and manufacturer of luxury sports cars. Little known fact: Lamborghini even manufactured an SUV at one time. Now they are owned by the Volkswagen Group through its subsidiary brand division Audi. However, back in the day Ferruccio Lamborghini, an Italian manufacturing magnate, founded Automobili Ferruccio Lamborghini S.p.A. in 1963 to compete with established rivals such as Ferrari. Prior to founding his company, Lamborghini had commissioned the engineering firm Società Autostar to design a V12 engine for use in his new cars. Lamborghini wanted the engine to have a similar displacement to Ferrari’s 3-litre V12 but in this case, he wanted the engine to be designed purely for road use, in contrast to the modified racing engines used by Ferrari in its road cars. Autostar was led by Giotto Bizzarrini, a member of the “Gang of Five” of Ferrari engineers, who had been responsible for creating the famous Ferrari 250 GTO, but left the company in 1961 after founder Enzo Ferrari announced his intention to reorganize the engineering staff. The engine Bizzarrini designed for Lamborghini had a displacement of 3.5 litres, a 9.5:1 compression ratio, and a maximum output of 360 bhp at 9800 rpm. Lamborghini unfortunately felt that the engine’s high revolutions and dry-sump lubrication system left room for improvement. The first Lamborghini chassis design was created by Italian chassis engineer Gian Paolo Dallara of Ferrari and Maserati fame, together with a team that included Paolo and Bob Wallace, more Maserati alumni. The body was styled by the then-relatively unknown designer Franco Scaglione, who was selected by Ferruccio Lamborghini after passing over highly regarded names including Vignale, Ghia, Bertone, and Pininfarina. Lamborghini designed and built the Lamborghini 350GTV in only four months, in time for an October unveiling at the 1963 Turin Motor Show. Due to the a conflict with engine designer Bizzarrini, a working power plant was not available for the prototype car in time for the show. 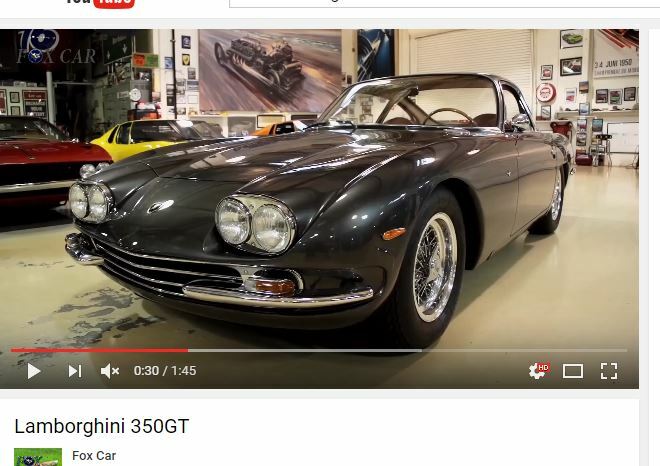 According to the myths, the car went on display in Turin without an engine under its hood yet the motoring press gave the 350GTV a warm response. The production model, which would be called the 350GT (no V), was restyled by Carrozzeria Touring of Milan, and a new chassis was constructed in-house. Bizzarrini’s V12 engine would be detuned for mass production, developing only 280 hp as opposed to the planned intended 360 hp (270 kW). The completed design debuted at the 1964 Geneva Motor Show, once again garnering positive reviews from the press. Production began shortly afterwards, and by the end of the year, cars had been built for 13 customers; Lamborghini sold each car at a loss in order to keep prices competitive with Ferrari’s. The 350GT remained in production for a further two years, with a mere total of 120 cars sold. 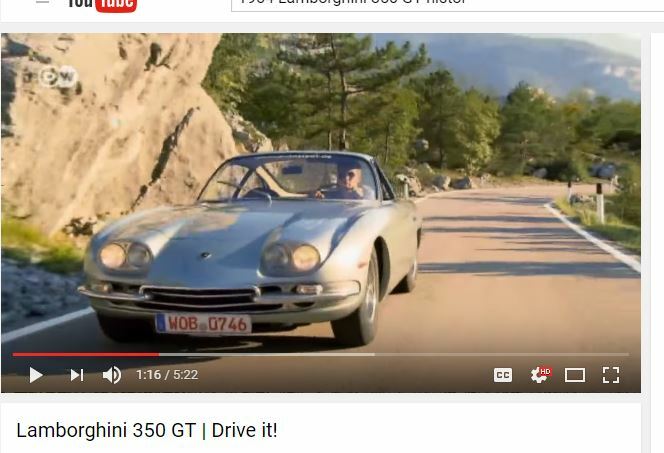 After producing 143 350 GTs, Lamborghini replaced it with the larger-engine 400 GT in 1966. What makes this car a landmark? Well, you can really tell that this car was a mere first effort as it really can’t hold itself compared to its competitors and even successors. It is still pretty impressive, with its all-aluminum alloy V12 engine mated to a five-speed ZF manual transmission. And it even had an aluminium body to cut down on weight which combined with a Salisbury differential, four-wheel independent suspension, and vacuum servo-assisted Girling disc brakes, made for an extraordinarily agile car. This car Was capable of going 0-60 mph in 6.8 seconds, and from 0 to 100 miles per hour in 16.3 seconds while going on to reach a top speed of 158 mph. Everything about this car screams out as the mere beginning of Lamborghini’s legacy as the most recognizable supercar brand. Even before it was made available to the public, refinements were made. Fixed Cibie headlights replaced the pop-up counterparts and manufacture of the bodies was entrusted to Touring of Milan. As opposed to the GTV prototype, this car featured side-mounted carburetors to reduce the height of the engine. Overall, the Lamborghini 350 was not their biggest success, but it was their first. Echoes of the car’s design choices made their way to their current slate of vehicles. And back then, surprisingly solid orders for the car ensured the companies’ survival and paved the way for what Lamborghini would become. From Ferrari’s perspective, a new competitor had risen. And this competitor that used a wealth of talent within two years to produce a product that could take on Ferrari performance anytime.